Metallic maroon with a metallic silver roof. Fitted with a 1216cc Coventry Climax engine with twin Weber 40 DCOE carburettors, a high lift camshaft and a stainless steel four branch exhaust manifold mated to a four speed MG gearbox. This Series 11, Bristol bodied Elite was taken off the road in 1969 because of mechanical troubles. After laying dormant for over twenty years and passing through several hands a restoration was started. 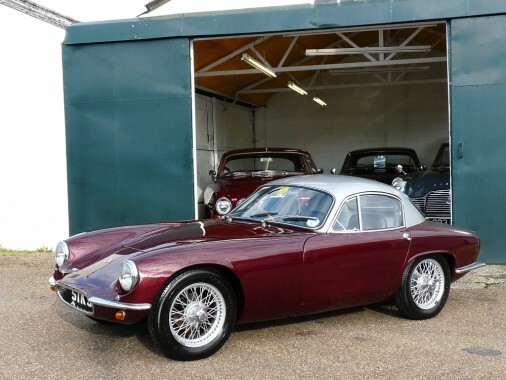 The bodywork was refurbished and repainted to a high standard, the engine and gearbox were rebuilt by Alan Voights (Lotus gearbox and engine specialist) and a new wiring loom, new carpets and suspension components were fitted. All mechanical wear and tear items were overhauled or replaced. Fibreglass Services fitted a new subframe and carried out other works in 1996. Rechromed bumpers were fitted and the interior trim was finished off along with other remedial works. The seats were retrimmed and the window fittings rechromed and the car was put on the road in 2001 since when it has covered 4,000 miles. It has been well maintained since and received a brake overhaul a thousand miles ago. All the work is documented in the comprehensive history file including photographic evidence of the Climax engine rebuild. The Elite is in fine condition today and is mechanically sorted and ready to use.